Turner Broadcasting System, the purveyor of networks with a global audience such as CNN, TBS, and TNT, needed a database that could service their microservices framework. Application development was increasingly becoming too complicated for it’s legacy RDBMS installation. 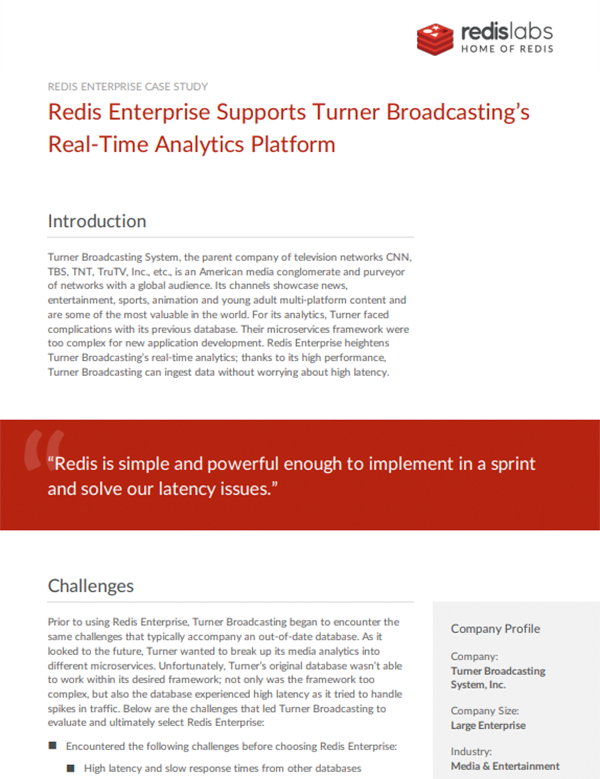 Thanks to Redis Enterprise’s high performance, Turner Broadcasting’s real-time analytics platform can now ingest data without worrying about high latency. To break up its media analytics solution into different microservices and enable extremely fast ingest of data typically required for truly accurate analysis. Redis Enterprise is simple and powerful enough to implement in a sprint and solve our latency issues.